Your TMJ, or temporomandibular joints, are the small set of hinges on your jaw located in front of your ears, and these joints enable your jaw to move smoothly whenever you speak, eat, laugh, or yawn. 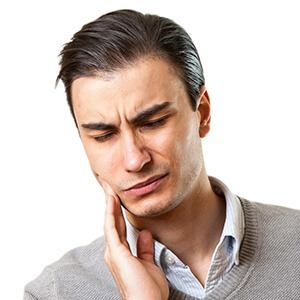 They can sometimes become strained or injured, leading to a variety of conditions that are generally referred to as temporomandibular joint dysfunction (TMD). Symptoms of TMD are very wide ranging, and it can be hard to identify on your own. Fortunately, Dr. Thomas Novak, Dr. Johannsen, and our team are specially trained to diagnose and treat this exact kind of issue. To learn more about this problem that many people have but aren’t aware of, simply read on below. It’s surprising that so many different issues can stem from your jaw, right? When you come in for your regular checkup, we will examine- your jaw and test its range of motion. If you experience any of the symptoms we listed above, we can recommend a variety of treatments to help relieve your pain. An occlusal splint is a special kind of mouthguard designed to treat problems with the TMJs. When we recommend an occlusal splint for a patient, we will custom make their mouthguard so that it fits comfortably over their teeth. When a patient is wearing the splint, it will gently shift the jaw into a new position, one that is meant to help the agitated muscles relax and heal. A patient will only need to wear it when they go to bed, and it can also protect the teeth if a patient grinds them. 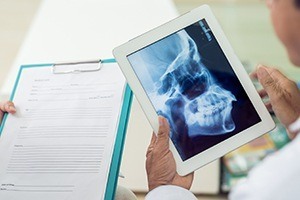 Eventually, the jaw muscles should be able to reorient themselves into this new position on their own without the appliance, at which point the patient will be able to stop wearing it. In some cases, however, a patient will simply need to wear it continuously in order to avoid symptoms. If any of the symptoms we listed above sound familiar, you very well could be suffering from TMD. 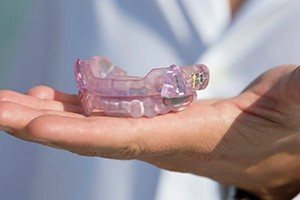 The answer to your chronic pain could be as simple as wearing a small mouthguard to bed each night. To start getting the relief you need, please contact us today for an appointment.